A sure sign of fall is the appearance of winter squash. I know it's finally here when I get my first craving to make soup, and I finally succumb to the impulse to grab a pomegranate in the produce section. I never have specific plans for the pomegranate. I just want one. We did not eat a lot of squash in our house when I was a child. We had yellow crookneck, zucchini (which was most exotic to us the first time my mother brought some home), and acorn squash baked with margarine and brown sugar, and that was about it. I liked squash, but I didn't know how to cook it outside of the few methods I learned at home. Since I started this blog, I have become much more fearless in using ingredients with which I am not familiar. For the past few years, I have given myself the challenge to come back from every green market excursion with something I have never before prepared. Once I get it home, I do some research and figure out how to cook it. A few years ago, the unfamiliar ingredient was butternut squash. I really loved how the butternut squash saute turned out, and made a note to myself that I wanted to work with butternut squash again. And forgot about it for three years. I don't know how that happened, but I was determined not to let it turn into four. I grabbed the first one I saw this season and brought it home with me. I looked through my spreadsheet of untried recipes and found one I had taken from Cooking Light Magazine last fall. 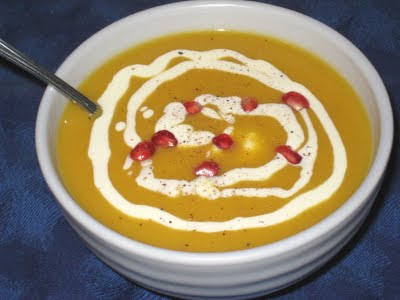 I loved the idea of roasting the squash with shallots and then making the soup. I pulled out the recipe and took a look at it. Along with the squash and shallots, the recipe also called for a half-inch piece of ginger in the roasting pan. Having perfected my ginger carrot soup, I wanted to bring a different flavor profile to this soup. So I decided to leave the ginger out of this recipe. I thought sherry might add a nice woody depth of flavor, and it did indeed provide a rich, nutty counterpoint to the sweet nutty taste of the squash. Soft as velvet, this soup will slide down your throat. Place the cubed squash and halved shallots in a roasting pan and toss with the olive oil. Season to taste with salt and pepper and roast in the 375-degree oven for about 45 minutes, or until tender. Let cool for 10 to 15 minutes. Put the roasted vegetables into a large soup pot and add the chicken broth. Add salt and pepper to taste. Bring to a simmer over medium low heat. As soon as it has started to simmer, remove from the heat and, using a stick blender, blend the mixture until it is smooth. Return the pan to the stove and bring back to a simmer. Add the milk and stir well. At this point, you can either add more milk if it is too thick, or you can start adding water. Taste and adjust seasoning. Add sherry and mix it in. cream and pomegranate seeds. Sprinkle with a slight dusting of nutmeg, if desired.